Andromeda, as it looks if observed from Seattle, WA at 8 pm PST on Jan. 7, 2007. The discovery of halo stars located far from Andromeda's center suggest our nearest galactic neighbor is much bigger than previously thought. SEATTLE - The discovery of several large, metal-poor stars located far from the center of the Andromeda galaxy suggests our nearest galactic neighbor might be up to five times larger than previously thought. The newfound stars are massive, bloated stars known as red giants. Although found far beyond the most visible portion of Andromeda-its swirling disk-the stars are still gravitationally bound to the galaxy and make up part of its extended "halo." 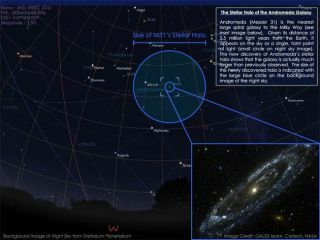 The finding, presented here Sunday at the 209th meeting of the American Astronomical Society, suggests Andromeda is at least one million light-years across [image] and could help settle a discrepancy between Andromeda and the Milky Way that has long puzzled astronomers. A dim foreground star and a bright star located much farther away-whose light can be diminished by interstellar gas-can be hard to tell apart because they appear to have similar luminosities as stars in our own galaxy. The researchers liken the effect to distinguishing between the light of a firefly 10 feet away and that of a powerful beacon in the distance. According to current galactic formation theories, the halo is the first part of a galaxy that forms. Stars in the halo are predicted to be metal poor because they formed during a time when the universe had much less heavy metal content than it does now. Heavy metals are created as stars evolve and then spewed out into interstellar space when ancient stars either explode as supernovas or shed their outer layers to become white dwarfs.